BAFTA Award-winning director Joe Wright (Anna Karenina, Atonement, Pride & Prejudice) directs Chiwetel Ejiofor (BBC’s The Shadow Line, Children of Men, Dirty Pretty Things) in the UK premiere of an epic retelling of a vibrant nation's turbulent first year of freedom. Chiwetel returns to the London stage following his Olivier Award-winning performance as Othello to play Patrice Lumumba in his Young Vic debut. Bursting with music and dance, this gripping drama charts the rise and fall of legendary leader Patrice Lumumba, whose passionate determination to free his people from Belgian rule inspired great courage and betrayal. A Season in the Congo tells the true story of the 1960 Congo rebellion and assassination of the political leader Patrice Lumumba in three turbulent acts. After taking control of the newly-formed coalition government, the charismatic leader is immediately beset by resistance from European economic interests, American policymakers and long-simmering tribal divisions. Securing the assistance of a UN peacekeeping force only serves to further divide the Congolese people as Belgian arms and soldiers start to pour into the country. Stripped of his position and placed under house arrest, Lumumba attempts a final march to power but is fatally betrayed by a former ally. A Season in the Congo received its world premiere at the Venice Biennale in 1967 and now has its UK premiere at the Young Vic. Aimé Césaire was a poet, playwright and politician from Martinique, who played a key role in the Négritude movement that originated in the 1930s amongst prominent literary figures in opposition to French colonial rule. Return to my Native Land became a classic text of the movement aiming to restore the cultural identity of people of black African descent. A Season in the Congo, the second of Césaire’s three epic plays of decolonisation, reflects his concern with the viability of the African independence movements of the early 1960s. Joe Wright’s stellar film credits include the six-time Oscar nominated Atonement which premiered at the 2007 Venice Film Festival, making him the youngest director to open the prestigious event. He received four Oscar nominations and won a BAFTA for Pride & Prejudice in 2005. His boldly theatrical adaptation of Tolstoy's Anna Karenina starring Aaron Taylor-Johnson, Jude Law and Keira Knightley was one of the biggest film openings of autumn 2012. Ahead of his Young Vic debut, Joe will direct Arthur Wing Pinero's Trelawny of the Wells at the Donmar Warehouse in spring 2013. Chiwetel Ejiofor received an Olivier for his portrayal of Othello at the Donmar Warehouse in 2008, and a Critics’ Circle and Evening Standard Award for his role in Joe Penhall’s Blue/Orange at the National Theatre in 2000. Chiwetel has received three Golden Globe nominations for his work on screen. Film and TV audiences will have seen him last in BBC drama The Shadow Line as well as in Stephen Frears' Dirty Pretty Things, the dystopian sci-fi Children of Men and thriller Salt. 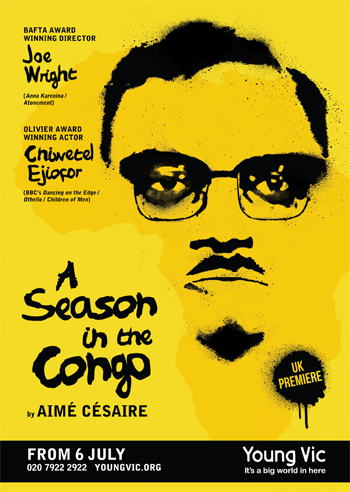 A Season in the Congo​​​​ by Aimé Césaire is directed by Joe Wright with design by Lizzie Clachan and light by Jon Clark. Chiwetel Ejiofor plays Patrice Lumumba. 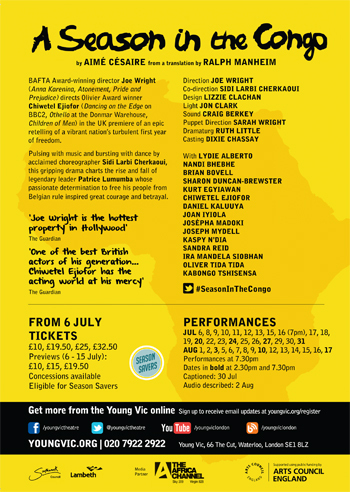 Info: A Season in the Congo is at the Young Vic from 6 July to 24 August 2013. Book tickets, here.